I struggled with this painting. It just didn't want to come out how I was picturing it. My sweetie was very helpful with some constructive criticism. At first my cat totally looked like a mouse. I did some fixing and now it sort of looks like a cross between a cat and a bunny. Oh well. In addition to the mouse-y cat, it was originally very flat-looking, so I added a defined horizon line and a bunch of shading to the boat. 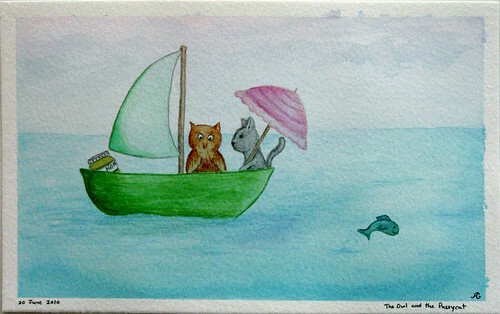 Later, I twiddled with the water, adding some more shading and a bit of green and pink around the boat. And I spontaneously added a fish to balance the composition. I decided that I was satisfied enough with it that I'd better quit before I futzed with it anymore. While I'm working on something is when I tend to feel most critical of it, since I'm focused on all the bits that aren't turning out how I wanted. Usually it grows on me later. And in any case, it's all good practice with my new paints.